The art of designing beautiful jewelry for our clients is centered around listening to what they want - turning dreams into realities. Custom jewelry projects start with a number of different circumstances. Some rings wear out over time, some clients get tired of the wedding set they have had for a number of years and in some cases people inherit jewelry that needs to be updated. 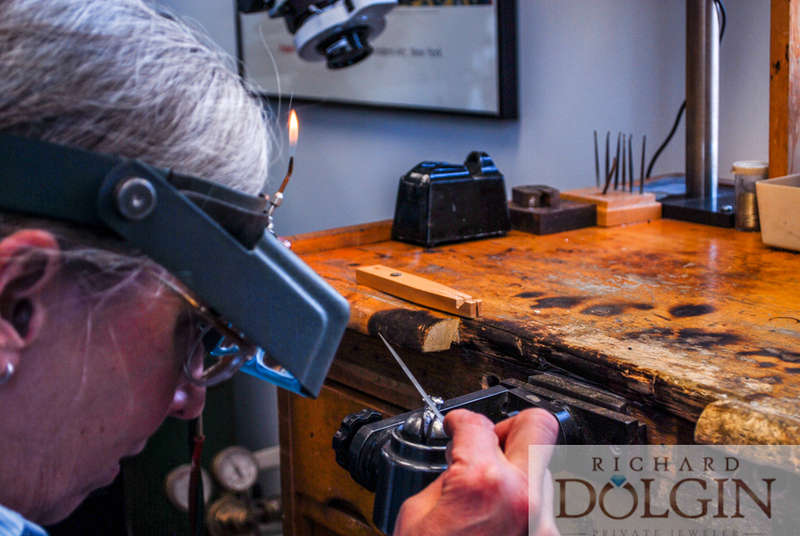 Most people come in to Richard Dolgin Private Jeweler after realizing they want a new piece of jewelry with a plan or idea of what they are looking for. Our job in cases of this sort is to listen carefully and take these ideas and turn them into reality. We use our expertise to make sure the client’s ideas can be incorporated and engineered into a wearable piece of jewelry. Sometimes the best plans have to be changed in order to make jewelry that is wearable on a daily basis or at least most of the time. When planning a new design the type of metal, figuring out the gemstones we have to work with, and the setting technique all have to be considered when making a durable yet beautiful piece of jewelry. In other cases clients come in with old treasures with no idea of what they actually want. At that point it is the responsibility of Marsha and I to look at the jewels they own and turn it into a piece of jewelry our client will love. In these cases, after speaking to our client and getting to know them, we can use our experience and expertise to custom design a piece that will delight them. After engaging our client to try to fish out any ideas of what they are they are thinking about their new piece of jewelry, we start with a thumbnail sketch to see if we are on the right track. After the thumbnail sketch is approved, we either do a CAD/CAM design on the computer or Marsha will carve a handmade wax model. After the model is completed we call the client for a second approval. Once the model is approved it is sent to the casting company to be cast in the metal that our client decided upon. A week to ten days later we receive a rough casting from the company, which gets filed, sanded, and pre-polished to make it ready to set with stones, if gemstones are a part of the project. After the setting work is completed, the piece goes in to the polishing room for its final finishing work. As we work through this project, we take and save all the photos, which we send to our clients so they will have a history of the creation of their new jewelry. If you have a dream about a custom jewelry project, contact us at Richard Dolgin Private Jewelers and we will have fun designing you a new piece of custom jewelry.